This talk will introduce several recent research projects done by my students and I from the NUS HCI research lab, National University of Singapore. They include SandCanvas, Vignette, and Magic Cards. In SandCanvas and Vignette, we have developed new digital artistic media that simplifies the creation of sand animations and pen and ink illustrations. In Magic Cards, we propose an alternative strategy of human robot interaction: instead of explicit control with robots, the user implicitly controls a robot by issuing commands on corresponding real world objects and the environment. Robots then discover these commands and complete them in the background. These projects aim to enrich our creative expressivity and bring convenience and joy in our lives. In addition, a few other older projects will also be briefly described. Dr. Shengdong Zhao is an Assistant Professor in the Department of Computer Science, National University of Singapore. 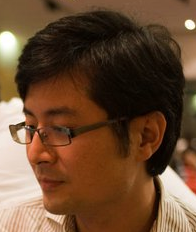 He started and currently manages the NUS HCI research lab. Shengdong completes his Ph.D. degree in Computer Science, specialized in Human Computer Interaction, at the University of Toronto. He also holds a Masters degree in Information Management & Systems from the University of California at Berkeley. He has a wealth of experience in developing new interface tools and applications. His work has been published in prestigious conferences (ACM CHI, ACM UIST, WWW, and IEEE InfoVis) in the past few years. He is the recipient of the NUS Young Investigator Award in 2009. More information about Shengdong can be found at http://www.comp.nus.edu.sg/~zhaosd.